STONY BROOK, New York -- Millions of shark fins are sold at market each year to satisfy the demand for shark fin soup, a Chinese delicacy, but it has been impossible to pinpoint which sharks from which regions are most threatened by this trade. Now, groundbreaking new DNA research has, for the first time, traced scalloped hammerhead shark fins from the burgeoning Hong Kong market all the way back to the sharks' geographic origin. In some cases the fins were found to come from endangered populations thousands of miles away. Published online today in the journal Endangered Species Research, the findings highlight the need to better protect these sharks from international trade, a move which will be considered by the Convention on International Trade in Endangered Species (CITES) at its March 2010 meeting in Qatar. The work was led by the Guy Harvey Research Institute and the Save Our Seas Shark Center at Nova Southeastern University and the Institute for Ocean Conservation Science at Stony Brook University. The U.S. has proposed that CITES list the scalloped hammerhead and five other shark species under the organization's Appendix II, which would require permits for, and monitoring of, all trade in these species across international boundaries. Knowing the species and geographic origin of fins being traded would allow management and enforcement efforts to be allocated more effectively. "Although we've known that a few million hammerhead shark fins are sold in global markets, we now have the DNA forensic tools to identify which specific hammerhead species the fins originate from, and in the case of scalloped hammerheads, also what parts of the world these fins are coming from," said Dr. Mahmood Shivji, senior author on the paper and Director of the Guy Harvey Research Institute (GHRI) and Save Our Seas Shark Center, both at Nova Southeastern University (NSU) in Florida. "This trade has operated for years and years under the cover of darkness," added lead author, Dr. Demian Chapman, now with the Institute for Ocean Conservation Science at Stony Brook University (SBU) in New York. "Our work shows that the scalloped hammerhead fin trade is sourced from all over the globe and so must be globally tracked and managed." 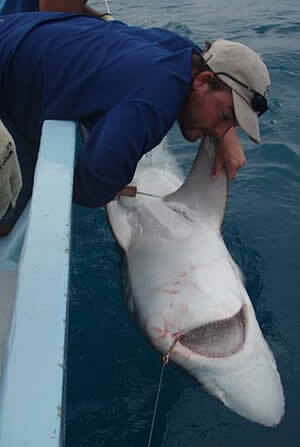 The new research paper, "Tracking the fin trade: genetic stock identification in Western Atlantic scalloped hammerhead sharks (Sphyrna lewini)," is published in a special theme issue of Endangered Species Research entitled, "Forensic Methods in Conservation Research." Using CSI-like methods known as "genetic stock identification" or GSI, Drs. Chapman and Shivji along with Danillo Pinhal of the GHRI and Universidade Estadual Paulista, Brazil, analyzed fingernail-sized DNA samples from 62 scalloped hammerhead shark fins that had been obtained in the Hong Kong fin market. By examining each fin's mitochondrial DNA sequence -- a section of the genetic code passed down by the mother and traceable to a sharks' regional birthplace -- the researchers were able to exactly match 57 of the 62 fins to an Atlantic or Indo-Pacific ocean origin. The team also analyzed mitochondrial sequences taken from 177 live scalloped hammerheads in the Western Atlantic and determined that the species is further divided into three distinct stocks in this region: northern (U.S. Atlantic and Gulf of Mexico), central (Belize and Panama), and southern (Brazil). The scientists traced 21 percent of the Hong Kong fins back to these Western Atlantic stocks. Scalloped hammerheads in the region have been categorized as endangered by the IUCN (International Union for the Conservation of Nature) since 2006. This coastal species appears to have collapsed in the western North Atlantic and Gulf of Mexico. "The premium prices commanded by fins have fueled a global shark hunt of epic proportion," said Dr. Ellen Pikitch, Executive Director of the Institute for Ocean Conservation Science at SBU, which funded a portion of the research. "Earlier work found that up to 73 million sharks are killed annually to supply the fin markets, and approximately 1-3 million are hammerheads," said Dr. Pikitch, who is also a Professor of Marine Science at Stony Brook University. "Inadequate protection, combined with inexorable pursuit, has placed many shark species at grave risk." Just 1 kg (2.2 lbs) of scalloped hammerhead fin can sell for about $US120 at Hong Kong markets due to the large size and high "fin needle" content of this species' fins. Needles are the sought-after portion of the fins, used as thickener in the soup. "The fact that scalloped hammerhead shark DNA shows strong population DNA signatures means that we can trace the geographic origin of most of their fins sold at markets," Dr. Shivji said. "From a broader perspective, this type of DNA forensic testing of fins will be an incredibly useful tool to prioritize areas for conservation and ensure sharks aren't wiped out in particular regions by excessive fishing." This study builds upon a DNA test developed in 2005 at the Guy Harvey Research Institute by Dr. Shivji and Debra Abercrombie, a research scientist now with the Institute for Ocean Conservation Science at SBU. The test enabled scientists to rapidly and definitively distinguish between three similar hammerhead species: great, scalloped, and smooth, from fin or meat tissues alone. The new GSI technique takes that DNA test to the next level. GSI has been used to trace some fish, sea turtle and marine mammal catches back to their geographic origin. This study marks its first use with sharks. Dr. Chapman is now working on DNA tools to identify a shark's geographic origins even more precisely, while both he and Dr. Shivji are working on developing GSI for more shark species, including other large hammerheads. "The international shark fin trade must not continue to operate in secrecy," Dr. Chapman said. "We must use all tools available -- from CITES permitting to DNA tests -- to shed light on this trade and make sure that it does not drive these sharks to extinction." Drs. Pikitch and Chapman plan to attend the CITES meeting in Qatar in March to urge that these sharks be listed under Appendix II to receive better protection from trade. Finally, answers to the many questions and much needed proof! BRAVO for doing this Dr. Shivji and Debra Abercrombie! Thank you. Now if we can only hope it isn't too late. 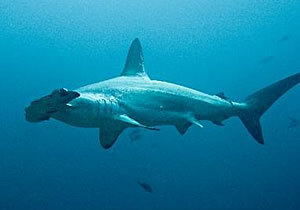 I have particularly seen the necessity for more protection of Hammerheads at Cocos Island. If Costa Rica is unable to patrol it`s waters adequately (I saw only a skiff with small outboard motor stationed there), then the rest of the interested world should contribute funds and vessels. Sharks are too much of a rare treasure to allow bandits ruin. A lot is being done about securing the future of our great planet regarding the out-let of ozone, combatting hunger and starvation, fighting dieseases and putting an end to poverty. In the meantime the great Apex Predators of the oceans, which has been around for more than 400 million years, are in dire straits and in great need of the same kind of focus. Each and every day (year round) more than 40.000 sharks are finned and left to die a horrible death by drowning as only the fins are used commercialy. This has been going on for decades and has eradicated more than 90% of the populations world-wide, which now treatens entire familie of sharks. The consequences if nothing drastic are done in due time, are catastrophic as entire eco-systems will be effected by the lack of these predators as the foodchains will be distorted. So every effort no matter how small is called for. Do support the local goverments and help them make the difference.